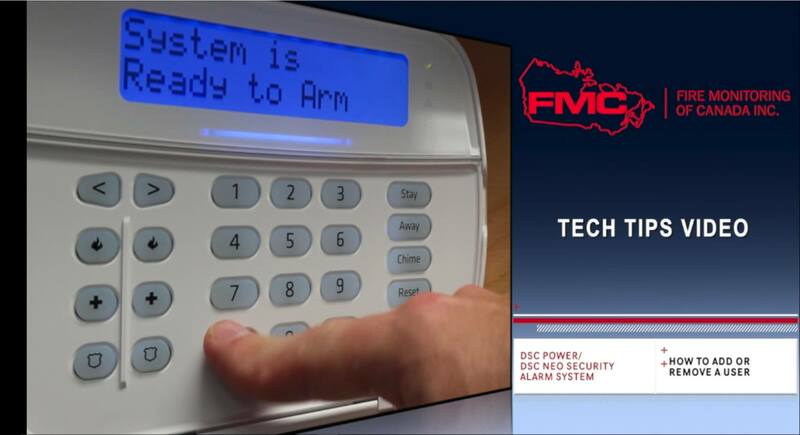 In this tech tip video, we’ll show you how to add or remove a User code from a DSC Power Series Security Alarm System and a DSC Power Series Neo Intrusion Alarm System. This will allow you to give people the ability to arm or disarm your security system, or take away that ability from others (if they are no longer employees, for example). This video shows you how to do this in a wireless keypad for the DSC NEO system, however these instructions are exactly the same for a DSC Power Series System. Click Play to find out how to add or remove a user from your DSC Security system, or read along in the caption below the video! 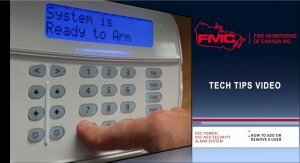 How To Add Remove a User From a DSC Power Series and DSC Power Series NEO Intrusion Alarm Monitoring System from Fire Monitoring of Canada Inc. on Vimeo. At your DSC Keypad, press the star button (*) followed by 5. The “Armed” light will illuminate on the keypad, and the “program” or “System Indicator” light will begin to flash. Use the < or > keys to scroll to the user you wish to program and press *. Used user slots will have a “P” beside the name. Using the number keys, enter the four-digit Access Code (ie: 1, 2, 3, 4). When programming is complete, you can enter another 2 digit code to program another code, or Press # to exit. If you wish to check to ensure the code has been entered, use the arrow keys to scroll the user you just added and make sure the “P” is present. To remove an Access Code, access the user section as described above. Select the two digit user code you wish to remove using the arrow keys. With the user selected press *. Press * again to enter the “Access Code” section. When in this section, with the code displayed, press the * key. This will delete the existing code. If you wish to check to ensure the code has been removed, use the arrow keys to scroll the user you just deleted and make sure the “P” has disappeared. Press # again to exit programming.